We get it — you are incredibly excited about the potential of your SumTotal solution. And why wouldn’t you be? SumTotal has been around since 1985, longer than almost all the other vendors in the space, and we’ve been building best practices and unique skills that benefit our customers every day. SumTotal customers include a range of Fortune 500 companies, and smaller, high-growth companies spanning nearly 160 ountries. Surveys show that customers like you are mostly happy with SumTotal. But imagine taking SumTotal further. 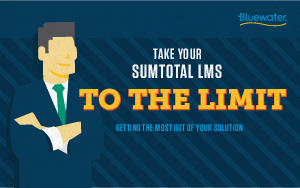 With a little bit of assistance, your SumTotal Learning Management System (LMS) can help you accomplish so much more. As powerful and far-reaching as SumTotal is, anyone could use a little help using it to solve more of their daily learning and talent management challenges. You’re not alone in thinking your SumTotal solution should help you do just that. With the right partner, you can achieve greater business results with SumTotal, removing headaches and hurdles that you may not even know exist.